A superb road ride covering some 40 miles through a quiet corner of Lochaber. Road biking suddenly becomes a real pleasure rather than a dual with heavy freight. On the other side of Corran Ferry, the roads are infinitely quieter than the A82, and you can expect to see more wildlife than people, particularly once you leave the main Strontian road. Parking by the slipway at Corran Ferry is limited but free, and there’s always enough space to squeeze in. Foot passengers and bikes are free on the ferry which runs every half hour throughout the day. Once over the other side there’s a few options for exploring by bike. Turn right and head up the single track road towards Treslaig and you may consider catching the wee passenger ferry into Fort William. Turn left and you can soon find a spot to abandon the bikes and take to a few hours exploring the shoreline, which is particularly open and accessible here. The Liddesdale Loop is very nearly bang on 40 miles, covers some spectacular Highland scenery and has a gruelling hill climb at Liddesdale, making it a great training ride for a handful of local enthusiasts or a great day out for the more casual rider. 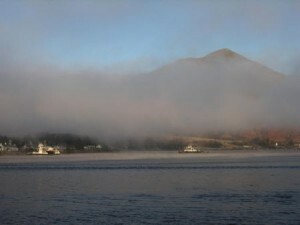 From Corran Ferry, turn left and follow the A861 along the loch side signposted for Strontian (about 14 miles). 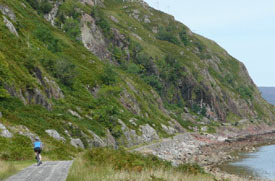 The first 5 or 6 miles follow the coast but from Inversanda expect a climb once the road turns west and heads through Glen Tarbert. Once over the high point you lose all the height gained and you’re back at sea level at the head of Loch Sunart. If you’ve got time on your hands, or need a bit of food then you can continue on into Strontian – treat yourself at Cozy Knits! Otherwise, turn left around the southern shore, signposted for Lochaline and the Mull Ferry. Enjoy a few more easy miles by the lochside; soon enough you’ll hit the climb at Liddesdale. Over the other side (280m up!) keep an eye for the left turn to Kingairloch. It’s not a big junction, though it is the only junction, and miss it and you’ll be a long way from your car! Its a long rolling descent to the coast at Kingairloch, and with a tail wind out of the west it’s a lot of fun. Don’t miss an opportunity to visit the Boathouse Restaurant at Kingairloch Estate if you’ve timed your visit to their opening hours. Lycra clad bikers in need of coffee are welcomed. Kingairloch itself is a magical little spot. From here the road hugs the coast again and though rougher than a badger’s back end, it’s just the best place to ride a bike. Deer and wild goats are likely. And if you’re really lucky you might even see otters fishing in the sea. There’s still time for another couple of short, sharp ascents before the road joins the A861 at the foot of the Glen Tarbert climb and the quick blast back to catch the Corran Ferry.